Hairy Mountain Folk: What’s the first thing you must do in London…? Imagine that you have traveled half way around the world from Blackheath in the Blue Mountains to Charing Cross in the heart of London. You have been sat doing nothing or sleeping and been feed airplane food for 24 hours with very small cups of tea or coffee. Now look deep inside yourself, while imagining these things, and reach for your heart’s desire… Now look at the photo on the right. Scary isn’t it!! 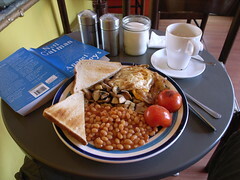 A full fry up breakfast in a greasy spoon café in the backstreets of Camden Town! I had to have a large café latte instead of the mug of tea which you can normally stand your tea spoon up in though.